Not only great for portraiture, this is a hugely versatile prime lens that delivers superb image quality, even when shooting handheld under very low lighting conditions. Canon own-brand lenses have been facing ever-stiffer competition of late, especially from Sigma and Tamron. Portrait primes for full-frame portraiture are no exception, as there are two excellent, recently launched 85mm lenses from the independents. The Sigma 85mm Art lens goes down the traditional route, designed around a fast f/1.4 aperture, and delivering stunningly sharp image quality. The Tamron 85mm is two-thirds of a stop slower, at f/1.8, but still produces fabulous image quality with very good and highly consistent sharpness across the entire image frame, in a much smaller and more lightweight build than the Sigma lens. Crucially, the Tamron also adds image stabilization, or VC (Vibration Compensation) as Tamron call it. Canon’s latest portrait primes aims to beat both competitors at their own game. With the launch of this Canon lens, portrait photographers no longer need to choose between a super-fast aperture rating for minimizing depth of field, or the inclusion of stabilization. Uniquely in its field, the Canon boasts the same f/1.4 aperture rating as the Sigma, while adding a stabilizer with the same nominal 4-stop effectiveness as that of the slower Tamron lens. Some might say that you don’t really need stabilization in a lens with a fast aperture rating, but we disagree. Stabilization enables the convenience of handheld portraiture indoors or at twilight, without the need to use flash or bump up your camera’s ISO setting, which degrades image quality. The overall bonus is that you can get super-smooth bokeh in defocused areas, even under very dull lighting, without image noise spoiling the effect. And naturally, if you want to stop downthe aperture a bit to give some detail in the surroundings, for environmental portraiture, stabilization can be a massive benefit as shutter speeds start to drop. Typical of Canon’s up-market L-series lenses, this one’s solidly built and weather-sealed. Like most modern prime designs, it has a complex optical path, based on 14 elements in 10 groups. Canon’s specialist ASC (Air Sphere Coating) is applied to combat ghosting and flare. At 89 x 105mm and 950g, it’s certainly not a compact, lightweight lens, but it’s still significantly smaller than the Sigma competitor, which measures 95x126mm and weighs in at 1,130g. 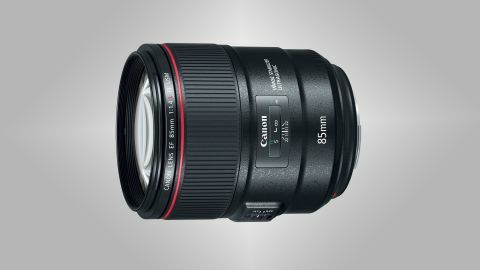 The Canon lens also has a more modest filter attachment thread of 77mm, compared with the Sigma lens’s 86mm. As you’d expect, the ‘slower’ Tamron 85mm f/1.8 is somewhat smaller and lighter, at 85x91mm and 700g, with a 67mm filter thread. The Canon’s build quality feels excellent throughout, and handling is refined with a smooth-action manual focus ring that enables precise adjustments. The ring-type autofocus system and image stabilizer are whisper-quiet in operation, although the stabilizer makes an audible clunk when it starts up and shuts down. Sharpness and contrast are superb, even when shooting at f/1.4, although the Canon isn’t quite as sharp as the Sigma 85mm when shooting at this aperture, especially towards the corners of the frame. Then again, corner-sharpness is seldom an important factor in portraiture. Even so, the corners become very sharp at f/2.8, and remain so through to f/11, dropping off a bit at f/16. The bokeh (quality of defocused areas) can be equally important as sharpness for portraiture and still life photography. This facet of performance is sublime, with a wonderfully creamy smoothness in blurred regions, and excellent quality in the transition between focused and defocused areas. Autofocus is both very fast and extremely accurate, making the lens equally viable as a short telephoto for action photography, rather than just being a ’portrait lens’. Ghosting and flare are very well controlled, living up to Canon’s claims. In our test, the image stabilizer enabled us to get consistently sharp handheld shots at around 1/10 sec, matching the benefit of the Tamron’s VC system. Not only great for portraiture, this is a hugely versatile prime lens that delivers superb image quality, even when shooting handheld under very low lighting conditions. For the money, it makes the Canon 85mm f/1.2L pretty much redundant. Outright image quality is no better than from the competing Sigma 85mm f/1.4 Art lens, which is actually slightly sharper, but the addition of stabilization makes the Canon more versatile. However, there are significant savings to be made if you’re willing to sacrifice two-thirds of an f/stop, in which case the Tamron 85mm f/1.8 is a top-value buy.